Orphaned at a very young age, Leon has always been a bright student and performs very well in school. When he’s not in school, Leon helps his aging grandmother around their home. Leon hopes to become a lawyer, and he works hard in his studies to achieve this goal. He has maintained a B average for his second year of high school, an impressively high grade. He says his favorite class is Chemistry, and he enjoys going to the lab to run experiments and gain hands-on experience in the subject. 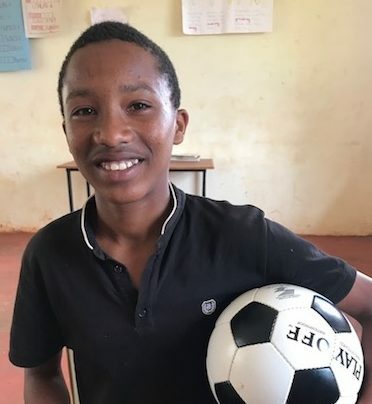 Leon also leads an active social life; he has many friends from many different places around Kenya, and he loves to learn about the different backgrounds his friends come from over a game of football. He also loves martial arts, and is enrolled in the martial arts club at his school. Leon is a happy boy, with a promising future ahead of him. He works hard in school, and deserves the opportunity to show what he is capable of. Help Leon live up to all his potential by sponsoring his education today!